If you're in the middle of wedding planning, it's probably time to pick out what you'll be wearing. To help you navigate the task of finding the perfect dress, we rounded up the best plus-size wedding dresses for any venue available from sizes 14 to 30. For shopping tips from a seasoned expert, we chatted with Molly Guy, creative director and co-founder of Stone Fox Bride. She has been in the bridal industry since 2012 and launched a line of plus-size wedding dresses with Eloquii last year. Here Molly Guy shares her top tip for curvy brides: "The one thing I know our plus brides are most concerned about is that they have enough support in their busts, and usually that means the dress can't be backless, so they can wear a bra with really good support. So that sort of translates across the board, whether it's beach or black-tie or barn." Molly also shared her tips on the best wedding dresses to look for by venue. Whether you're getting married on the beach, in the country, at city hall, or at a black-tie affair, we've rounded up the best wedding dresses for when you say "I do." Keep reading to shop plus-size wedding dresses from Stone Fox Bride, David's Bridal, ASOS, and more. "The most important thing our brides are concerned about when getting married on a beach is they don't want any fabric that's really clingy or thick or any lace that's stiff. They want to be mindful that the dress is not too tight in the armpits, and if they have long sleeves, that they are flowy," Guy says. We love this simple silk slip dress. Pair yours with sandals for the beach. With a dainty strap and low neckline, this maxi dress is perfect for a beach wedding. "This is a great time for a fitted dress—a beautiful, structured corset, a mermaid skirt, or a plunging neckline. It's the time to go with more structure like boning, a corset, mermaid skirt, or cumberbund if you really want to feel nipped and tucked," Guy says. This flattering waistline is elegant and effortless for your big day. Try a plunging neckline and a detailed bodice. Try something sparkling with this embellished dress. "For city hall weddings, the rules are kinda like anything goes. It's the time to wear a white pantsuit or wide-leg white pants with a white blouse and a black leather jacket or a beautiful little minidress. Something that is urban and chic, cool, where you can take your shoes off afterward and walk in the park or something," Guy says. Try the off-the-shoulder trend with this fitted ruffle-sleeve dress. Try something unexpected with a one-shoulder dress. The perfect style for a city hall wedding. "Wear something beautiful and chic and structured enough that's not super flowy and bohemian. They also work really well barefoot in the grass or with some flowers in your hair," Guy says. Long sleeves and lace are a pretty pairing. 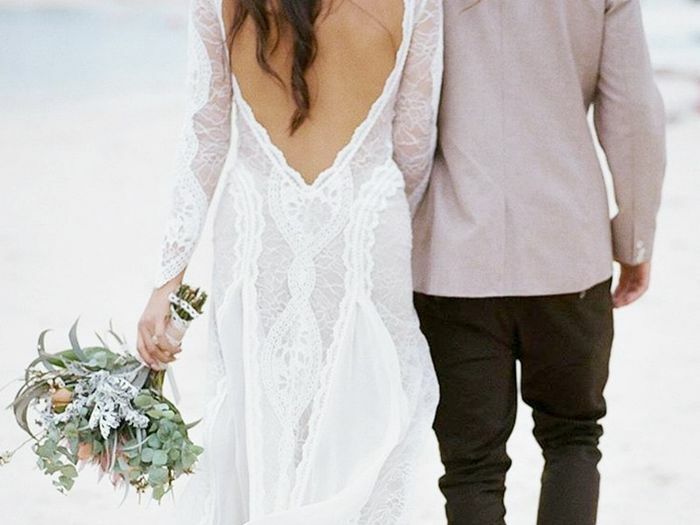 We love this robe-like dress for a bohemian bride. We love the pairing of luxurious lace with a pleated skirt. Next, read about the most flattering swimsuit styles for girls with big busts.